In 1999, my family visited Disneyland. We happily rode the Small World ride. I was 12 at the time and my sister was 6. We loved every moment and our parents smiled with nostalgia. At one time near the end, some lights suddenly shut off and rear lights illuminated the ceiling. The moving display parts shut off and crew members wearing red overalls walked along them to help passengers in the boats onto the stages to direct them out of the building via emergency exits. The staff wouldn’t tell us much as they quickly ushered us out of the building. Ambulances were outside and a police car was parked in the main walkway. At the time, my mother still had her camera out and snapped a few photos of the crewmen and close-ups of the mechanical children. She snapped a few last-minute photos of whatever to use up the last of the roll of film on the camera, since we were going to develop them later that afternoon, anyway. This was the last photo on the reel, aimed at the ceiling at the attraction. It looks like a Chucky doll to me. The author mentions that the staff wore red overalls. There’s a person hanging from the ceiling in red overalls. 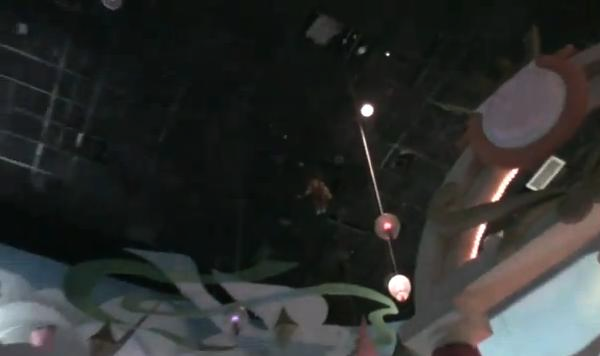 Pretty sure that’s a doll from the ride suspended to the ceiling for storage/maintenance. I would like to know what the uploaded did in order to include the picture. Copy paste just provides with the pictures title for me. This is definitely one were you can feel the pit of your stomach drop when you zoom in on the picture trying to figure out what it is. … Its times like this when I get annoyed I can’t give 0 out of 5 stars. I really like the idea of the kid dying at one of the happiest rides in the park really creepy reminds me of the gallows…really good job with the pasta! I was getting into it and then it just dropped me off and I was let down. Good start though. I don’t see the damned kid! I did enjoy this simply due to the picture of the child hanging from the rafters. However, the story, itself, was short and not very descriptive nor creepy. Good job on trying, though. It looks like a thew things, a hell hound, Mickey mouse with zombie face, hanging person. Any one see what it acutely is? true one are often the most creepy. How about next summer we go to Disney world? I honestly couldn’t see anything wrong with the picture at first. I had to lean in and squint. Then, I saw the kid hanging from the ceiling. Very Well Done Story! I’ve Heard Of This Incident In The Small World Ride And Thought You Did An Outstanding Job Of Filling In The Gaps And Adding To The Story. I’ve seen this on another forum, where the story was better; in the centre of the picture, it looks as though there’s a child(?) hanging from the ceiling. Is something dangling a doll or a kid? I can’t see the picture. Sad face. Why are people having so much trouble seeing the child? Story was ok. I couldn’t get what they were referring to until I read the comments though. Bruh, if your gonna hang yourself, do it where it wont ruin everyone’s day, okay? okay! I just read the name DisneyLand and was terrified already. Wow, there’s a hanged kid on the ceiling. Is it one of the animations? That ride creeped me out! So much build up, weak ending. Disneyland In 1999, my family visited Disneyland. We happily rode the Small World ride. I was 12 at the time and my sister was 6. We loved every moment and our parents smiled with nostalgia. At one time near the end, some lights suddenly shut off and rear lights illuminated the ceiling. The moving display parts shut off and crew members wearing red overalls walked along them to help passengers in the boats onto the stages to direct them out of the building via emergency exits. A voice came over the loudspeakers. "Disneyland thanks you for your visit. Please evacuate the attraction in an orderly fashion. Keep looking foward and follow the directions of staff. Thank you." The staff wouldn't tell us much as they quickly ushered us out of the building. Ambulances were outside and a police car was parked in the main walkway. At the time, my mother still had her camera out and snapped a few photos of the crewmen and close-ups of the mechanical children. She snapped a few last-minute photos of whatever to use up the last of the roll of film on the camera, since we were going to develop them later that afternoon, anyway. This was the last photo on the reel, aimed at the ceiling at the attraction.